Brelsford WSU Visitor Center, 150 E. Spring St. The Pullman Farmers Market presents the Pullman Winter Market for the 2018-2019 season. Featuring local producers and artisans offering handmade and homegrown goods. 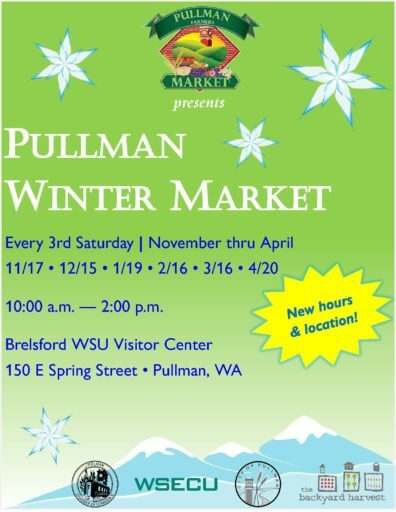 The Pullman Winter Market occurs every third Saturday from November-April. Keep up to date by following us on social media @pullmanmarket on Facebook and @pullmanfarmersmarket on Instagram.